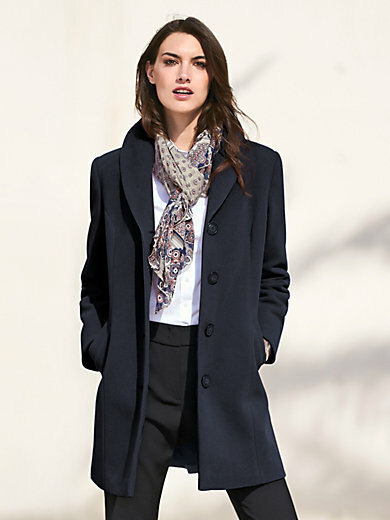 Jacket by Peter Hahn – genuinely figure-flattering with elaborate dividing seams, flattering shawl collar and diagonally cut welt pockets. Highly recommended for every style and every figure! Featuring turn-up slit sleeves. Buttoned inside pocket. In 60% new milled wool, 20% nylon, 20% cashmere. Lining in 100% polyester. Length approx. 32ins. The coat should be dry cleaned.